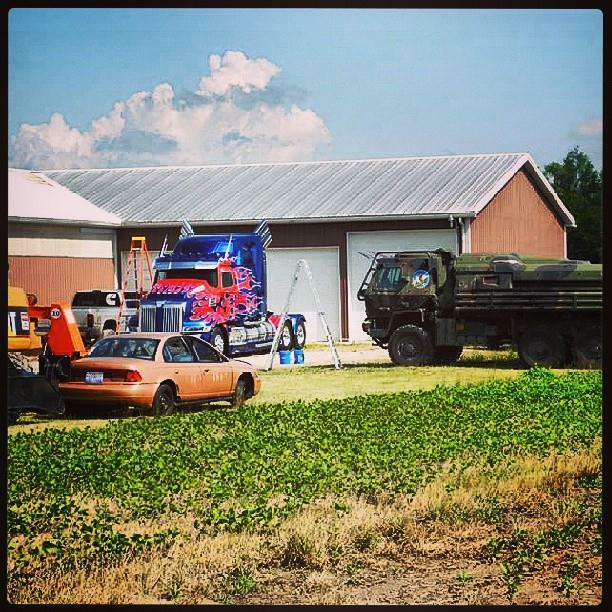 Today Transformers 4 production was filming in Adrian, Michigan. I have not seen any mention of the actors being seen on set but Transformers vehicles were including the new Optimus Prime truck, Hound and the just introduced 2014 Argosy. As the videos below from thelifeofyourtime show, it seems that Prime might be under attack (from the air?) as he goes racing down the road with explosions going off around him as the Argosy about half a mile back. Last video shows a car hitting another one but not enough detail to identify the vehicles involved. Below are a few more images that Sam Nickelson found on Instagram or you can hit his TFW2005 thread for all of them by clicking here. 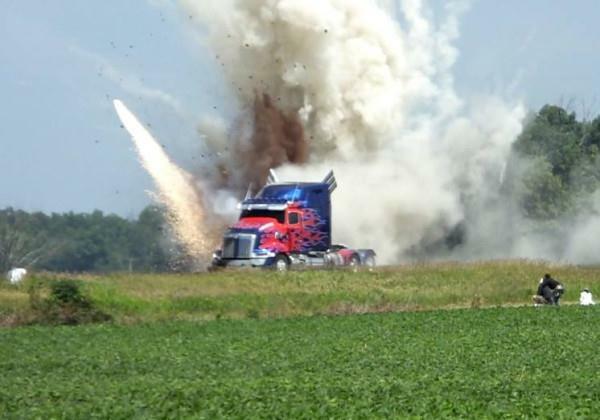 I bet there was a 2nd Optimus in case the 1st got damaged by the explosions... just a guess. Those videos are SWEET... Nicely done TLOYT! A. Ultra Magnus is trying to catch up to Optimus in order to protect him, but isn't making it. B. 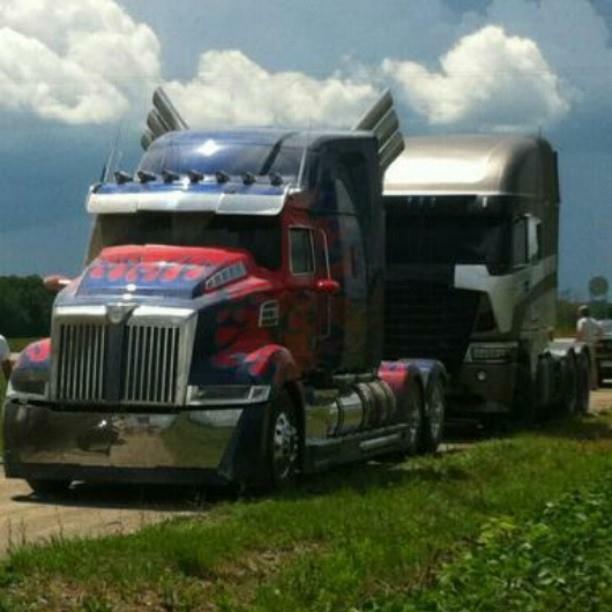 An aerial Decepticon is assisting Motormaster in a car chase. 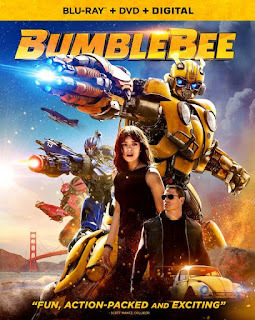 I was just thinking, if that was Ultra Magnus wouldn't an Autobot logo be visible on the front or side of the truck like Optimus Prime and Sentinel Prime? 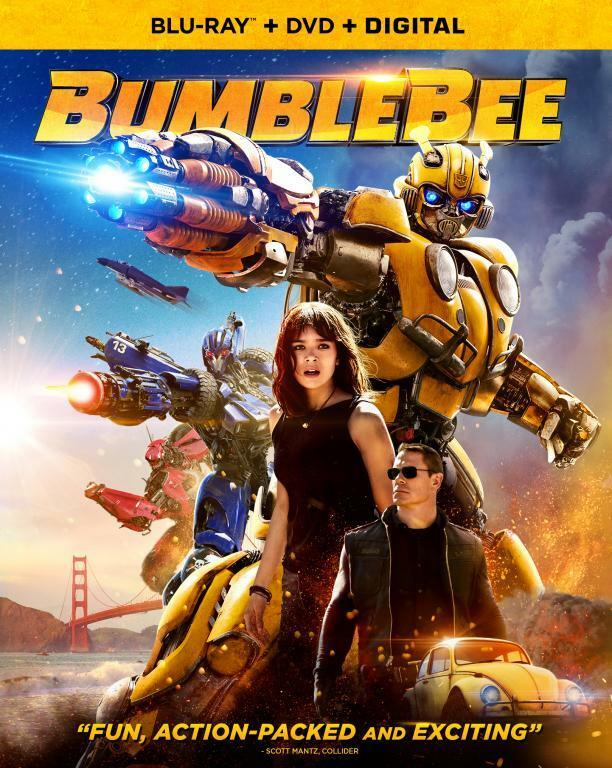 After all he is one of the "big" characters in the Transformers franchises. Another reason is, since Ultra Magnus is another leader like character, wouldn't he have unique features on the truck to distinguish him from the "regular" Autobots? I am not saying that this is not Ultra Magnus, but in my view i think this is more likely to be Mototmaster. 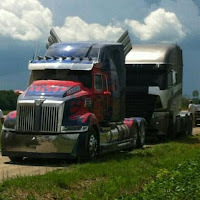 Yeah that truck is a decepticreep chasing Prime..
NO..... Please give us the Stunticons! new news guys, one of the wreckers(leadfoot) was on set in a Photo. As usual options gets attacked while the other Autobots are either nowhere to be seen or miles away....for a leader he doesn't get much help does he?